Welcome to the 996 Takeover. Our Dear Leader Androoo started out the week, but has already run out of cars (hmmm). 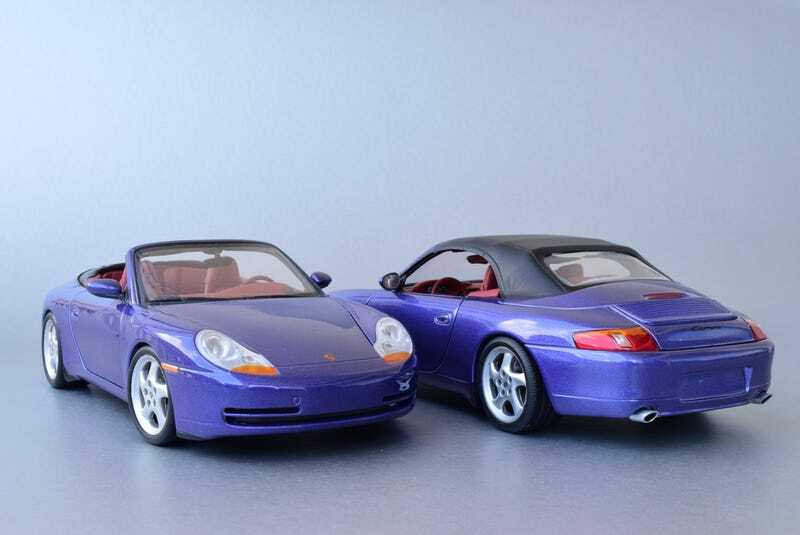 As I need to prove my bonafides to the 996 cause in order to join his illustrious society, I’m gonna take over starting with this pair of UT 996 cabrios. You may be wondering why I have 2 of what is basically the same car. I couldn’t decide if I wanted top up or top down, and since they were only $15, I figured why not both? Being a UT, this is a 20+ year old model, but as is often said about the brand, it hides its age well. Dogleg doors and slightly prominent lens mounting stubs up front are the main give-aways to its age. Both cars have the infamous “melting wheel” syndrome, but I’ve seen and have worse examples. The models are no longer $15, but can still be had pretty cheap. So show some 996 love and go get one. Or two.